The District has some of the most competitive technology incentives in the country. 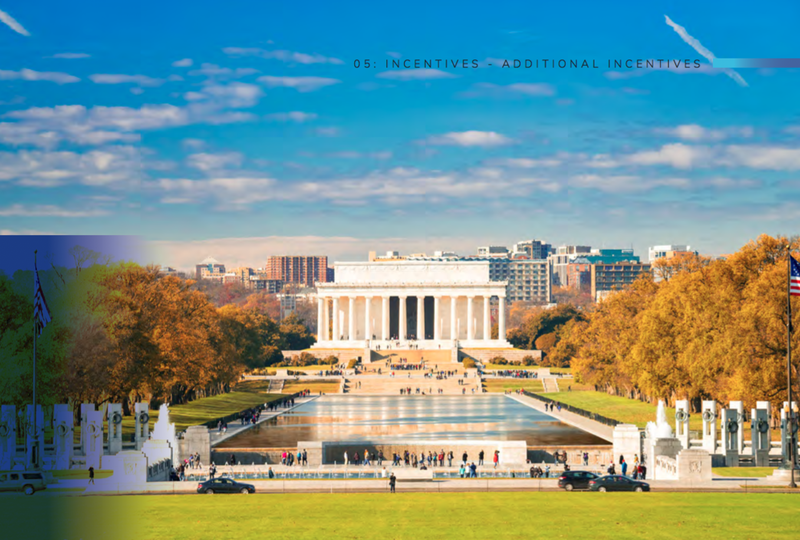 For Qualified High Technology Companies (QHTCs) like Amazon, an existing incentive program in DC offers one of the most attractive incentive packages for high-tech businesses of any jurisdiction in the country. The QHTC incentive reduces the cost of doing business by providing certain credits, exemptions, and other benefits that address Amazon’s upfront capital outlay and ongoing operating costs. This incentive exists in DC’s tax code, eliminating uncertainty from a long legislative process. This valuable, on-the-books incentive serves as the baseline for how the District government has engaged technology companies around incentives. We are prepared to work with Amazon to craft a package that accommodates both the company and the District. This package addresses Amazon’s main concerns – initial capital outlay and ongoing operating costs. Several aspects mitigate capital outlay on building costs, technology hardware and software purchases, and relocation expenses as Amazon builds and expands in DC. A permanently lowered corporate franchise tax rate plus carry-forward credits mitigates Amazon’s ongoing operating costs in the District. Amazon’s benefits in the District will be based on Amazon’s performance in the city. Several aspects of Amazon’s business model impact the total bene t including: the number of relocations or new hires coming to a DC HQ2, its investment in DC office properties and business tools, and the manner in which Amazon structures its corporate tax liability. We estimate the value of this package to be between $488 million to $1.05 billion from the selection period through 2034. The result is a long-term and flexible [package that lowers the cost of locating and doing business in the District substantially. Below are the seven major components of the QHTC incentives and their estimated values for Amazon. This abatement freezes the real property tax rate of buildings where Amazon locates. For the first five years of occupancy of an office building, the real property taxes are frozen, minimizing the impact of improvements on the building’s assessment. The freeze applies to either a build-to-suit or direct lease scenario. If Amazon takes a direct lease of a building delivered in shell condition, the incentive is not dependent on Amazon making the improvements, allowing Amazon to gain the benefit through rent concessions passed through by a building owner. By allowing Amazon full consideration of its capital investment, either directly or as a benefit provided through a building owner, Amazon can continue to leverage its market power, minimize real estate costs, and maintain its reporting methodology. In calculating the estimated benefit of $10-13 per square foot, we assumed a 33% assessment increase due to initial capital improvements. Qualified tangible personal property that Amazon purchases is exempt from the 3.4% personal property tax for the first ten years of purchase. If the tangible personal property is used or available for use in the eleventh year or thereafter, the property is then reported at 25% of the original cost or exchange value (unless it is technological equipment, reported at 10% of the original cost or exchange value). In calculating the impact of this incentive, we assumed a $375 per square foot aggregate spend on equipment, furniture, and qualifying internal use software over the term of the office buildout. Amazon will be exempt from sales tax on intangible property or services otherwise subject to retail sales tax, plus sales of computer software or hardware, operating and applications software, computers, terminals, display devices, printers, cable, fiber, storage media, networking hardware, peripherals, modems, and more. In calculating the estimated benefit of this incentive, we assumed a $100 per square foot spend on qualifying tech equipment and internal use software. With this incentive, Amazon will receive a credit against its corporate franchise tax liability of up to $10,000 ($5,000 per year) for each qualified FTE. The benefit is equal to 10% of the wages paid over the first 24 months to a qualified employee, up to the $5,000 per year cap. The benefit triples if the new hire is a veteran. There is a 10-year carry forward provision, and the credit is non-transferable or refundable. In calculating the estimated benefit of this incentive, we assumed that 5% of new hires would be veterans, and that the average wages would be at least $100,000 per year. With this incentive, Amazon will receive a credit against its corporate franchise tax liability of up to $5,000 for each qualified full-time employee (FTE). This benefit is equal to the amount reimbursed to or paid on behalf of a qualified employee for the cost of relocating the employee to DC. The credit is not available if the relocation costs are claimed as a deduction. There is a per-year cap on the credit limited to $1 million per year, and it may be carried forward 10 years. In calculating the estimated benefit of this incentive, we presumed that Amazon would likely maximize the $5,000 per employee credit. This provision brings Amazon’s corporate franchise tax rate to zero for 5 years, commencing after the date that the company has taxable income, up to $15 million dollars total. When calculating the estimated value of this incentive, we presumed Amazon would collect the maximum benefit on $15 million in corporate franchise liability within the first five years. After the 5-year corporate franchise tax exemption period ends or the $15 million limit is reached, Amazon would be subject to a reduced corporate franchise tax rate of 6% instead of the current 9% rate. A recipient of District support must abide by District law that requires compliance with District Certified Business Enterprise and First Source requirements. The specifics of the compliance depend on the nature of the project and support. The Deputy Mayor’s office stands ready to assist Amazon with fully understanding and executing all required documents. The Deputy Mayor’s office has worked with employers and District agencies to implement alternative arrangements in situations where public policy and employment goals can be met. Upon Amazon’s decision to locate HQ2 to Washington, DC, the Department of Consumer and Regulatory Affairs (DCRA), DC’s primary permitting agency, will provide Amazon with our Permit-In- A-Day service. This service will enable Amazon to complete all agency approvals for significant projects in a single day. It expedites our already-accelerated third-party permit review program, which generally takes a few months to complete for a large project. Permit-In-A-Day brings Amazon’s design professionals into a room with DC’s various permitting experts to obtain all approvals at once. This streamlined process allows for Amazon’s team to resolve complex design changes through face to face interaction, eliminating lengthy back and forth. With this service, design and construction can begin immediately, allowing Amazon to minimize its time to operations. The District government will provide a dedicated Amazon Ambassador in the Mayor’s Office to ensure seamless project approvals and reviews, and to shepherd any Amazon project throughout the government and the DC community. Government can be challenging to navigate - the Amazon Ambassador will know the ins and outs of government implicated by any of Amazon’s big ideas. From housing to transportation and education to public safety, the ambassador will assist Amazon staff in coordinating with permitting agencies and utilities during construction, and with forming meaningful engagements with the community and neighbors surrounding HQ2’s site before Amazon moves in — and throughout Amazon’s tenure as a DC company. The position will be full-time and fully funded by the DC government. The Ambassador will ensure that DC’s executive, legislative, and regulatory arms are thinking as big as Amazon is, and swiftly enabling Amazon to create and innovate in DC. The DC government will partner with Amazon to pilot and deploy autonomous vehicle (AV) shared transit solutions within the Amazon campus and beyond. DC strives to be at the forefront of autonomous vehicle technology. A first round of pilots for people-moving AVs will include a DC government-funded transit fleet deployment. As one of ten cities globally in the Bloomberg Philanthropies-Aspen Institute Autonomous Vehicles Initiative, DC has already begun to prepare the city for AVs. DC was one of the first jurisdictions in the country to pass legislation allowing autonomous vehicles on city streets, and will quickly craft any necessary regulations or further legislation to fully enable pilots and deployment. DC will work with Amazon to clear hurdles for piloting last-mile goods-delivery AV technologies as well. DC’s expansive fiber footprint spans the entire city with a one-of-a-kind 100Gbps optical backbone equating to almost 10 Tbps of aggregate capacity. The DC government operates a municipal Internet Service Provider (ISP) and has existing agreements allowing for easy expansion of its fiber footprint as needed. Commercial ISPs have widespread presence in the city (over 99%). It is one of the most advanced government owned and managed networks in the nation. Over this fiber infrastructure, the District government can provision dedicated symmetrical bandwidth up to 8.8Tbps for transport services or direct connection to Tier Internet and Cloud Service Providers. This includes Internet peering with multiple tier 1 providers at geographically diverse locations throughout the DC metro area. The DC government pledges that a fiber network will be available at all of the locations identified, installed to meet any Amazon schedule. At each of its sites, the District and its partners will work with Amazon to apply its core technologies as a foundational digital layer that functions across the live, work, shop, dine, and play experiences. Amazon Villages will combine Amazon Alexa and smart-home technologies with the latest retail and fresh food technologies (such as those pioneered by Whole Foods), automated vehicle infrastructure, and smart cities technologies. The integrated deployment will work seamlessly across indoor and outdoor spaces to create the next generation of urban environment for Amazon workers and visitors. This concept has already been developed by Akridge and Western Development for deployment at Buzzard Point, which is at the Anacostia Riverfront proposed site. The arrival of HQ2 will require the creation and preservation of housing across the income spectrum. Mayor Bowser has been a leader in planning for and investing in affordable housing to ensure the District is welcome to residents of all incomes. Should Amazon choose to locate its HQ2 in the District, the Mayor would use extra revenue produced by HQ2 to increase affordable housing investment. Based on the full buildout scenario provided by Amazon, the Mayor would commit to doubling the District’s annual investment in the production and preservation of affordable housing from $100 million to $200 million a year. This would produce affordable housing options for an additional 20,000 households. As the center for the most educated and diverse workforce in the United States, Washington, DC is poised to create a customized education and training center for Amazon that leverages the talent of DC’s residents and universities at DC government’s expense. Amazon University will include customized educational curriculum for bachelors, masters, and executive education as well as training and workforce development programs modeled after programs we have successfully executed with other corporate partners — all developed in partnership with Amazon and DC’s universities to meet Amazon’s specific talent needs. Amazon University will also facilitate partnerships with universities that bolster Amazon’s talent pipeline and workforce. Envision the Amazon Student Entrepreneurs Competition, the Masters Consulting Force, which will engage masters students in business, data science and policy in capstone projects that address Amazon’s needs, internship programs and hiring events, and collaborative research projects that inform product development and business strategy, such as Gallaudet’s DeafSpace Institute and Georgetown’s Massive Data Institute. As the preeminent region in the world for cybersecurity, Washington, DC’s concentration of technical expertise can expedite Amazon’s AI-based cloud security initiative, and provide accessible geographical alignment to Amazon Web Services’ significant presence in Northern Virginia. Each university in Washington, DC provides cyberrelated programming and extensive AI projects. George Washington University (GW) and American University’s (AU) Cybersecurity and Cybersecurity Governance Centers provide focused multidisciplinary research, education, and training related to cybersecurity in the public and private sectors. With a campus in Washington, DC, Amazon would be at the forefront of AI and cybersecurity, potentially creating partnerships with AU and GW to design an epicenter for cybersecurity drawing resources from multiple universities, government agencies including the Department of Homeland Security (DHS), National Security Agency (NSA), Department of Defense (DOD), National Institute of Standards and Technology (NIST), and the private sector. The densest concentration of Federal labs in the world is located in Washington, DC. These Federal research labs produce cutting-edge technologies on behalf of the government with broader potential applications across all industries. The District Government recently partnered with Hyperion Technologies, a DC-based startup company, to design a program to connect local MBA students and entrepreneurs with inventors from Federal labs to develop commercialization strategies. The collective partnership includes American University, University of Maryland, George Washington University, and Project 500, a local small business support program, and builds upon Hyperion’s Fed Tech program, which has been running at University of Maryland since 2013. Georgetown University and The George Washington University are prepared to craft Amazon-tailored curricula to support Amazon’s talent development priorities. Georgetown’s McDonough Business School and its School of Continuing Studies can develop custom executive education and training programs as they have done for a variety of private sector and government partners, including Ford, Booz Allen Hamilton, ADP, the Social Security Administration, and the US Army. They also offer professional masters and certificate programs in topics such as Cybersecurity, Cybersecurity Risk Management, and Applied Intelligence, as well as Technology Management, Systems Engineering Management, Project Management, and Human Resources Management. Additional opportunities include collaborating on efforts to promote educational mobility for Amazon employees without post-secondary education with tailored certificate or ‘micro masters’ programs. Amazon can also team up with Georgetown’s Medical Center and School of Nursing and Health Studies teams to create workplace wellness, worker safety, and employee health programs. The University of the District of Columbia (UDC) is positioned to develop and provide a talent pipeline to hire and train future Amazon HQ2 staff. In a public-private partnership with Amazon, UDC can tailor its curricula for any programs from advanced training certificates and professional skills development to a range of graduate and professional degrees in fields including urban sustainability, computer science, engineering, business, and law. The opportunity to reshape DC’s public higher education could present a rare opportunity for Amazon to shape the future of the education industry and have a resonating impact on the 80% of the nation living in urban communities. As the only land-grant institution in the US that serves an entirely urban community, UDC’s physical infrastructure includes campus sites near many proposed Amazon HQ2 DC locations, and is open to establishing a new satellite campus near or even within HQ2, to ensure accessibility. Each year, entrepreneurial students from DC-based universities (American University, Georgetown University, George Washington University, Howard University, Gallaudet University, and University of Maryland) host a joint pitch competition for new ventures. Participating schools send top venture teams to participate in the DMV Student Entrepreneurs Competition. In partnership with Amazon, future pitch competitions can involve Amazon business leaders and engineers to coach and mentor, sharing market opportunities with student entrepreneurs and faculty. Venture coaching programming could involve Amazon-led strategies, market research, idea gen, and pitch guidance with the support of faculty at each institution’s incubator. The Amazon DMV Student Entrepreneurs Competition would feature the most promising ventures from each of the participating universities, culminating in a final student pitch to Amazon leaders. Georgetown’s Policy School’s Massive Data Institute (and its Census Research Data Center in particular) offer opportunities for linking Amazon’s data to government and other data sets. The vision for the Massive Data Institute is to become a hub for people doing large-scale and modern data linkage – work that could provide tremendous business insights that inform Amazon’s long-term strategy. In addition, the Policy School recently launched a joint Data Analytics Masters program with the Graduate School (Data Science for Public Policy) that will produce graduates trained in modern data science and communication. Gallaudet is establishing a new, interdisciplinary field of Communications Engineering covering accessibility, information technology, linguistics, sign language interpretation, audiology, robotics and visual arts research and coursework, emphasizing visual communication, accessible verbal communication, and communication technologies on consumer electronics. Gallaudet’s DeafSpace Institute (DSI) serves as a center for discovery and application of knowledge about the ways deaf people sense and inhabit space as a novel means for exploring the behavioral impacts of space on people of all abilities. Through its user-focused research methodology, DSI seeks to develop an empathic approach toward architectural design, practice, education, and policy that empowers vulnerable communities to act on their own behalf. A new facility, Creativity Way, will be a collection of Knowledge Studios to support research and scholarship for Gallaudet’s students, from undergraduate papers, reports, and theses to graduate student Masters Theses and Doctoral Dissertations. These studios will support students’ advancement in STEM and STE-A-M fields and will provide rich career training opportunities for students.